by Goode, Stephen W.; Annin, Scott A. Differential Equations and Linear Algebra is designed for use in combined differential equations and linear algebra courses. It is best suited for students who have successfully completed three semesters of calculus. 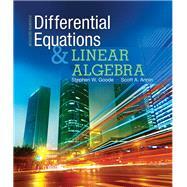 Differential Equations and Linear Algebra presents a carefully balanced and sound integration of both differential equations and linear algebra. It promotes in-depth understanding rather than rote memorization, enabling readers to fully comprehend abstract concepts and leave the course with a solid foundation in key areas. Flexible in format, it explains concepts clearly and logically with an abundance of examples and illustrations, without sacrificing level or rigor. The Fourth Edition includes many updated problems to support the material, with varying difficulty levels from which students/instructors can choose.